One "Simon Simpkins", described as a father of two from Pontefract, West Yorkshire, is quoted as being outraged when he saw one of the packets. 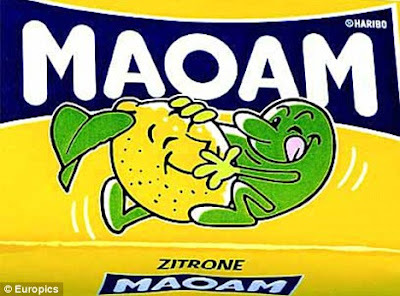 "The lemon and lime are locked in what appears to be a carnal encounter", he said. "The lime, whom I assume to be the gentleman in this coupling, has a particularly lurid expression on his face". "Mr Simpkins" sounds more amused than horrified (I hear his voice as something quite close to John Major's) but he goes on to claim that during a "heated exchange" with the shop manager his wife "became quite distressed and had to sit down in the car park". The story also appears in The Sun, where we learn that the children's names are Benjamin and Ofelia. Something is not quite right about this story, is it? It reads like a press release - not to mention the fact that there's no f in Ophelia, as it were. All versions of the story (of which there are now dozens) feature the same follow-up quote from the manufacturer, who explains that the packaging was introduced in 2002 and that "the jovial MAOAM man is very popular with fans, both young and old." The phrase also appears on the company's website. Space filled. Free advertising ensured. Amusing silly season item filed. As the meerkat says, Simples! No wonder an increasing number of newspaper bosses have come to the conclusion that journalists are an optional extra. UPDATE: Via Jon Slattery I discover this item from Brand Republic, which thinks the story "looks increasingly like a publicity stunt by Haribo", who by coincidence are currently conducting a sampling campaign for a new product line, and that the company's "marketing department appears to be lying low on this one". Also, the Telegraph's Jon Swaine is Twittering that there is no Simon Simpkins on the electoral roll in Pontefract and no record of an Ofelia Simpkins anywhere (absolutely no f in Ofelia, it seems). Thanks too to John B below who points out that while there might not be a Simon Simpkins in Pontefract there certainly is a Haribo UK in the town. I'm profoundly shocked by this news. But I'm glad to see that investigative journalism is not quite dead yet. This type of campaign, based on a superficially plausible"complaint" that just happens to draw attention to the product complained of, isn't exactly new. My personal favourite was the "Happy Endings Foundation", supposedly a group of concerned parents campaigning against the unsuitably dark Lemony Snicket books. The foundation had a website, which turned out to be owned by a marketing company employed by the offending books' publisher. Quelle surprise.